Genesis Media is one of the biggest media companies in the world with 220 million unique users globally. RumourJuice, part of Genesis Media, is a fast-growing entertainment media project reaching high eCPM audiences in the United States, United Kingdom, Australia and Canada. When RumourJuice’s team found a positive ROI model, their next challenge was to scale quickly without affecting the CPA. 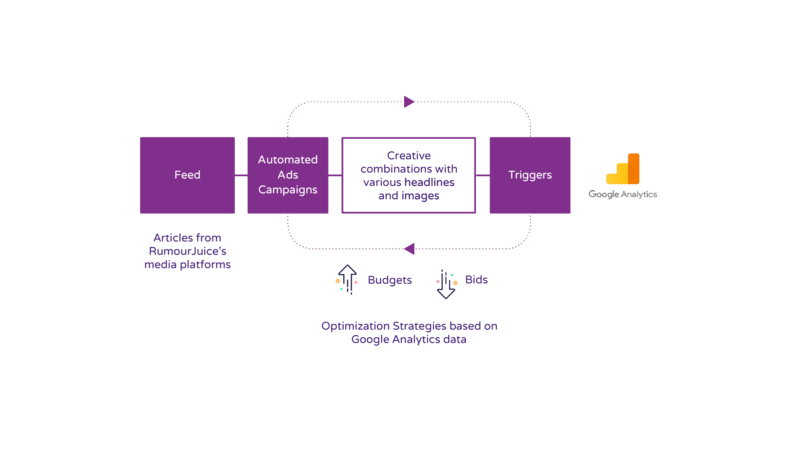 Since their marketing and content analytics were housed separately, it provided problematic as they would need to run a lot of tests and launch more campaigns than they were used to. Integration with Google Analytics and Smartly.io Pivot Tables enabled setup of automated rules based on user’s actions on the website, giving better control over ROAS and helped prevent inefficient spend without increasing CPA. Automated Ads helped us increase site traffic х10 and launch twice more ads, shaving off time otherwise spent on manual setup and optimization by 65%.